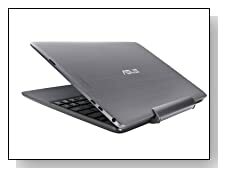 Grey metal versatile design ASUS Transformer Book T100TAM-H2-GM is a 10.1 inch detachable hybrid ultraportable touchscreen laptop with a faster processor than the previous model- the Atom Z3775 at 1.47GHz base speed, a capacity of 64GB Solid State drive in tablet and 500GB hard drive in dock, up to 11 hours of battery life, is designed for all day computing- a copy of fully licensed Microsoft Office Home & Student 2013 comes included. And you may probably be aware that Asus is an industry leader and it puts great emphasis on quality, innovation and customer satisfaction. ASUS Transformer Book is offered with the quad core Intel Baytrail-T Z3775 at 1.46GHz speed to 2.39GHz with turbo function and no hyper threading- it is already quad core, 2GB RAM for adequate multitasking, a storage of 64GB Solid-State in tablet and 500GB HDD in dock and a full version of Windows 8.1 operating system. So you’re getting a little performance improvement on what was already a pretty good tablet/notebook 2-in-1, free unlimited ASUS Webstorage space for 12 months for all your photos, songs and videos. It runs fast and you can use several apps and programs at the same time without major lags or freezing, also turns on very quickly from zero or sleep. 10.1 inch high definition touch display offers clear and full picture with a good range of brightness, has the IPS feature with 178 degree viewing angles and HD Graphics (Bay Trail) lets you play the older games fluently but is adequate for general graphics tasks. The Reading Mode adjusts the screen brightness, contrast and colours automatically to the environment. Touchscreen is nice to have with Windows 8.1 and is quite responsive- not much delay at all. It comes with the SonicMaster and bigger sound chambers for great quality more realistic, sharper, distortion-free sound on such a slim machine, despite being not so loud. Sound will be better with headphones but still good even though the speakers are at the back. You will find a front facing 1.2MP HD webcam for those live chats with friends and family. Grey metal Asus Transformer Book weighs 2.6 pounds and has the measurements of 6.7 x 10.4 x 0.8 inches- one of the lightest notebooks in the world, has a total of 11 hour battery life so you can be out and about all-day long without having to recharge but it charges in about 3 hours from zero, stand-by time is around 14 hours and wakes up from sleep almost instantly. It comes with a comfortable keyboard with a touchpad that supports multi-touch gestures. Connectivity options are the Wireless Dual-Band 802.11N, Bluetooth 4.0, microHDMI to connect to FHD TV if 10 inch screen feels small, microUSB 3.0 port for up to 10 times faster data transfers, microSDXC slot, microphone port and has volume buttons. It has a good build quality overall despite the cheap feeling plastic back, which shouldn’t be a problem to anyone considering how much this machine costs and all that you’re getting. 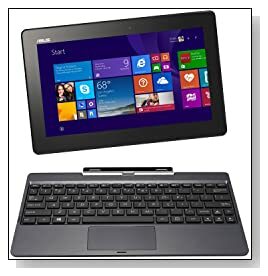 Conclusion: Sleek and versatile, lightweight and compact ASUS Transformer Book T100TAM-H2-GM is a great 2-in-1 ultraportable notebook with a 10 inch detachable tablet and the MS Office Home & Student 2013- Word, Excel, PowerPoint and OneNote is already priced at $139. You get 11 hours of battery life thanks to the ASUS Super Hybrid Engine II power management- the portability of a detachable tablet and the productivity of a notebook as well as perfect wireless. You can switch back and forth between tablet and laptop modes as much as you want throughout the day- and it is one of the lightest machines both as a tablet and a notebook. It saves all content when the battery goes below 5% with the auto back-up function. MyBitCast app makes sure your content gets automatically updated and synchronised so you can share content with others. 2GB RAM is good amount for multitasking- very little lags or freezing. Touchpad feels just OK so you will be better off with an external mouse. It comes with some bloatware but can be removed easily. If you don’t want or need a high end powerhouse for games or very complex programs but something that performs the daily things efficiently in a compact and small size, Transformer Book is a great hybrid machine to get as it offers some of the best value for money on the market for a hybrid.